CAT 2018 Question paper along with candidate responses was released a little while ago. CAT 2018 Question paper – both slots are now available for free download – you can get them in this post below. CAT 2018 Response sheet – the answers that the candidates entered are available on the official CAT website. The process to get the same is given in a video below. CAT 2018 Official Answer key was just released. 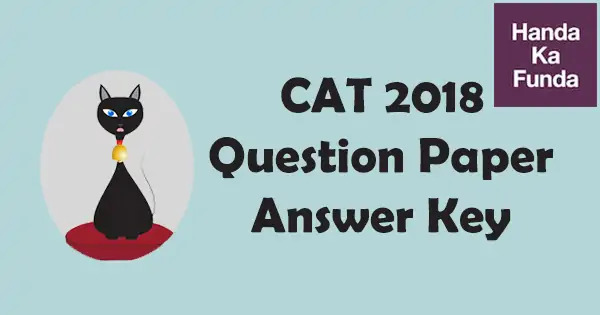 CAT 2018 Question Paper with video solutions for all questions will be available as a part of our CAT 2019 online coaching course. Once the CAT 2018 Question paper was released, we worked hard on finding out the answers to as many questions as possible. We have marked those answers in RED and given the files for download. We will keep updating the files as and when we find most answers. You can download the CAT 2018 Question Paper from the links given below. Some students might want to try out the CAT 2018 question paper without looking at the answers or solutions. So we have a created a version for that too. You can download this PDF and take a print of it as well if you wish. CAT 2018 Official Answer Key – How to find? This Official answer key is for the paper we have given for download above. Questions and options were in a different order in different papers. Please download the paper we have released and match it with your paper. This answer key is for the paper we have given for download above. Questions and options were in a different order in different papers. Please download the paper we have released and match it with your paper. Morning Slot – Logical Reasoning and Data Interpretation: Q12 answer should be 1 (October of 2017). Can you recheck? Its a Good Thing that you guys are working on the key, but there are mistakes for sure..specially in quants section of afternoon slot. Thanks for pointing it out. We have updated it. We have added the CAT 2018 Answer Key for Verbal Slot 2 now. Why didnt you uploaded VA afterneeon slot key?? We have added it now. Your answer for Q18 in DILR Slot 1 seems wrong. Can you please provide an explanation for it. Dear sir, answer keys for morning slot, for DI/LR shouldn’t answer to Q19 (16) be less than answer to Q 18 (5). Because if we are allowed to make one mistake than we can take lesser number of numerals to fill out the matrix.